Articles by "WC Nanning 2014"
After 2011 Worlds, China’s Yao Jinnan had suffered disappointing results at top major international competitions, from injuries to inconsistency. But today, Yao made a remarkable redemption. The 19 year old Chinese gymnast won the gold medal on her strongest event ‘uneven bars’ beating her teammate and the reigning World bars champion Huang Huidan. At last year’s Worlds, Yao was denied a medal on bars after a fall on the G rated Mo Salto bars release. At London Olympics, she finished fourth on the event. Jinnan had the highest difficult score in the meet, a 6.9. Her overall score is 15.633 while Huang scored a 15.566 with a difficulty score of 6.8. The third place went to new senior Daria Spiridonova of Russia who scored 15.283. This is the same result Daria had at the last European championships. US Ashton Locklear who qualified first, missed the podium by just 0.017 points behind the Russian gymnast. The reigning European champion Rebecca Downie finished in 5th place and the reigning Olympic bars champion Aliya Mustafina again finished off the podium. Lisa Katharina Hill of Germany and Great Britain’s Ruby Harrold placed 7th and 8th respectively. On vault, US Simone Biles was denied a third gold medal by North Korea’s Hong Un Jong who won her country’s first World gold medal in women’s gymnastics in 23 years. Un Jong performed two of most difficult vaults in the sport a cheng ‘6.4’ and an Amanar ‘6.3’ giving her an edge over her competitors. Hong Un Jong and Simone Biles scored 15.599 and 15.554 respectively. Third place went to Biles teammate Mykayla Skinner who performed a Cheng and a double twisting Yurchenko, she received a score of 15.366. Russia’s Alla Sosnitskaya finished fourth. British Claudia Fragapane and European vault champion Giulia Steingruber of Switzerland tied in 5th place. While Alexa Medina of Mexico and Vietnamese Thi Ha Thanh Phan who is the 2011 World vault bronze medalist finished 7th and last respectively. Last year, US Simone Biles won the all around gold medal at her first World championships, today she repeated this feat as expected. The two time World all around champion posted the highest scores on vault and floor exercise, and the second highest score on balance beam. Her total score is 60.231. Biles is the second American gymnast to win two World all around titles and the first since Russia’s Svetlana Khorkina in 2003. Now Biles has a total of four World gold medals and a silver, with still three more finals to go. Second place went to Romania’s Larisa Iordache who is 0.466 points behind Biles. Iordache was the only gymnast to score over 15 on balance beam. This is the first World all around medal for Romania since Steliana Nistor won hers in 2007. At last year’s Worlds, Iordache finished fourth in the all around. This medal is Iordache’s best result at Worlds. Multiple Olympic and World medalist Aliya Mustafina of Russia had a shaky beam routine followed by a fall on her first tumbling pass, knocking her out of the podium for the first time. Mustafina has made the podium in every single major all around competition she has competed in since she has turned senior in 2010. Mustafina finished fourth behind US Kyla Ross who is holding onto her reputation of hitting her routines and winning despite having a lower difficulty than her rivals. This is the second World all around medal for the American gymnast. A fall on her double tuck on floor exercise made China’s Yao Jinnan lose any chance of clinching a medal today. She finished 5th with an all around score of 57.465. Vanessa Ferrari of Italy placed 6th, while Alla Sosnitskaya of Russia placed 7th. 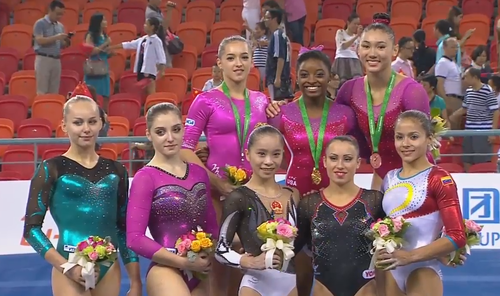 The United States of America won today the gold medal at Nanning’s team final today. 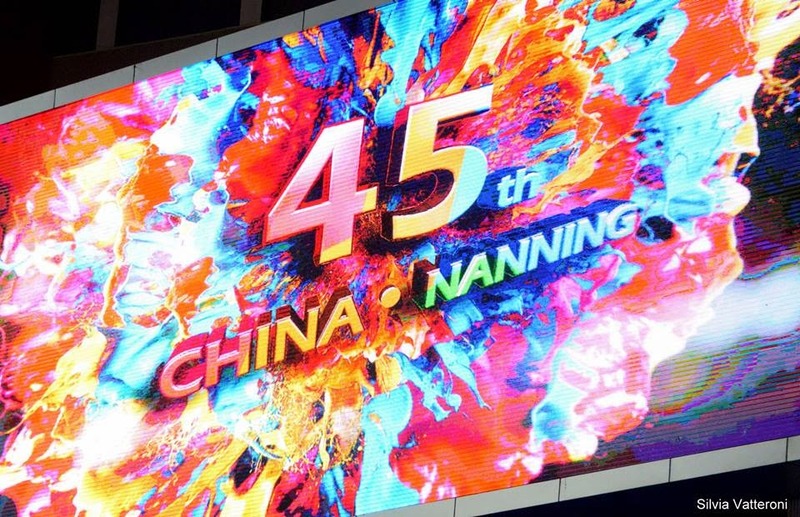 They won easily over host China by over six full points. This is the 4th World gold medal for USA and the first time for them to successfully defend their title. China had a rough competition. On uneven bars which is their strongest apparatus, Shang Chunsong missed on kip cast to handstand and let herself fall. Veteran Yao Jinnan missed her Tkatchev. On floor exercise, Chen Siyi put her hands down on her last tumbling pass. 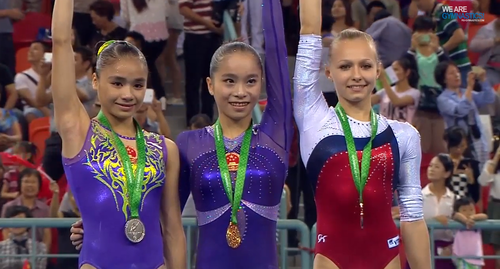 China scored 172.587, securing a silver medal. They had the highest score on balance beam. Like China, the Russian team struggled to stay on their feet and were facing the possibility of missing the podium. Alla Sosnitskaya fell to the sides and off the mat on vault and also had a fall on floor. Ekaterina Kramarenko had a fall at the beginning of her beam routine. European balance beam champion Maria Kharenkova who did not qualify to beam final due to a fall, hit her routine and scored an impressive 15.033. They won a bronze medal over European champions Romania by only 0.499. It is worth to mention that had Alina Stanila of Romania stayed on balance beam, Romania would have knocked Russia down to 4th place. Italy had good competition, they placed behind Romania. They were one of the only two teams who did not suffer a fall in the final. Great Britain, Australia and Japan placed 6th, 7th and 8th respectively. On the 10th of October, the individual all around competition will be held. In Nanning, Romania suffered from a meltdown and was at the brink of being eliminated from the team final, but once again Larisa Iordache proves that she is crucial to her team. Romania was presented by a mostly inexperienced team whose nerves got the better of them. Except for Larisa, the gymnasts were plagued with falls and mistakes. Andreea Munteanu whom pressure of being a great beam worker got to, suffered from a fall and failed to make it to the final. Anamaria Ocolisan had two falls on bars and one on beam. Stefania (Alina) Stanila who competed last year at Worlds, also had a fall on beam. While, Paula Tudorache and Silvia Zarzu were hesitant, missed some connections, but they managed to stay on the apparatuses. Hence, Larisa Iordache is the only member of the team who has a shot at medalling on Romania’s signature apparatus. Romania finished the qualification with a total of 219.161 having the 3rd best score on vault and floor and 4th on beam. 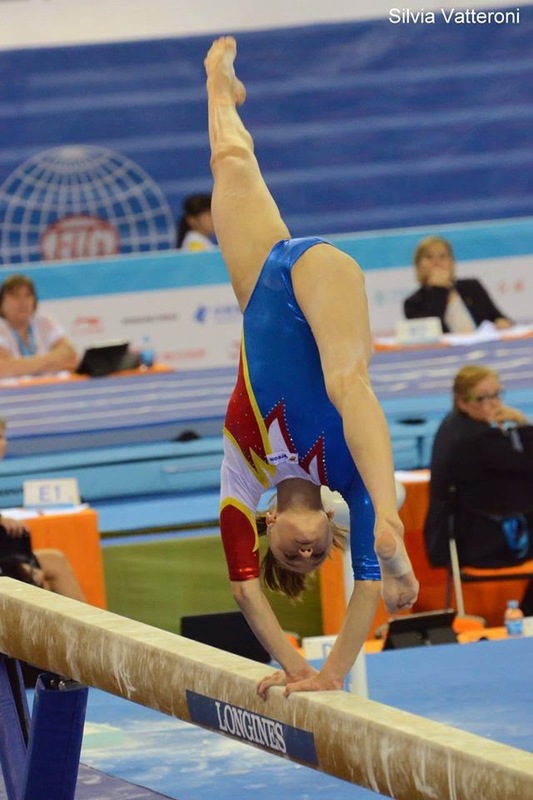 Uneven bars remains Romania’s Achilles heel. They placed last on the event. As for the individual scoring, Larisa Iordache places second on beam and floor behind U.S. Simone Biles. 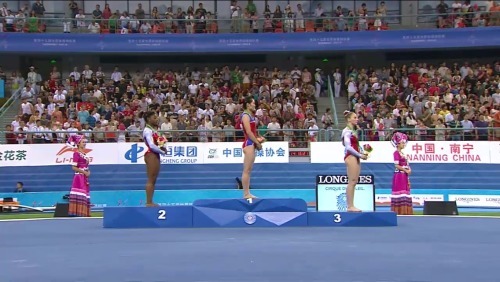 Out scored by Aliya Mustafina and Simone Biles, she came in 3rd position in the all around. It is worth mentioned that Iordache scored higher than Mustafina on vault, balance beam and floor exercise. Beside Larisa, Stefania Stanila qualified in 21st place for the Individual All Around. If we are to reflect over Romania’s performance yesterday, we must put in our minds that the team is new and there is time to improve. It took two days for the gymnasts and teams to qualify to the final. Here, we bring you the summary of the 45th World championships’ qualification. Eight teams qualified to the team final and twenty four teams qualified to the pre Olympic World championships which will be held in Glasgow, Great Britain. Romania had a meltdown and qualified in disappointing 7th. Larisa Iordache of Romania qualified in 3rd place to the all around, 2nd to the floor exercise and balance beam final. She narrowly missed out on the vault final by just 0.051. Simone Biles of USA made all individual finals but uneven bars in first place. Yao Jinnan of China qualified in first place to the uneven bars final, third to the balance beam final and fourth to the all around final. The reigning world bars champion Huang Huidan of China qualified to the event’s final in 2nd place. US Ashton Locklear qualified in 3rd place to the uneven bars final. China’s Tan Jiaxin originally placed 3rd on bars but will not qualify due to two per country rule. The reigning European bars champion Rebecca Downie of Great Britain qualified in 5th place to the bars final. Daria Spiridonova of Russia qualified in 6th place for bars final. Ruby Harrold of Great Britain qualified in last place for the bars final. 2008 Olympic vault champion and 2013 World Bronze medalist Hong Un Jong of North Korea qualified to vault final in second place. US Mykayla Skinner qualified to Vault and floor final in 3rd place. Her all around score placed her in 6th place but won’t compete in final because her teammates Kyla Ross and Simone Biles out scored her. Lisa Katharina Hill is the only German gymnast to qualify to event finals, 7th on uneven bars. 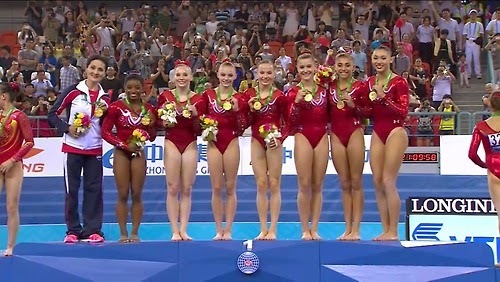 Triple World silver medalist Kyla Ross of US made only two individual finals, balance beam (7th) and all around (5th). At last year’s Worlds, she qualified to all finals but vault and won medals in the all around, uneven bars and balance beam finals. European floor champion and 2013 World floor silver medalist Vanessa Ferrrari of Italy qualified to floor final in 4th position and all around final in 7th position. Spain’s Roxana Popa did not make any event finals. She tied in 8th place with Australia’s Marissa Miller but was knocked out of the final since Miller had a higher E score. Popa will be seen competing in the all around (qualified in 10th place). Claudia Fragabane of Great Britain qualified in 7th place on vault, 6th place on floor and 13th in the all around. China’s Shang Chunsong had the fifth highest score on balance beam but won’t compete due to two per country rule. However, she qualified to the all around final in 7th place. China’s Bai Yawen qualified in 4th place on balance beam. Italy’s Erika Fasana qualified in 7th place to floor final and 18th to all around final. Alina Stanila of Romanian qualified in 21st place to the all around. The reigning European beam champion Maria Kharenkova of Russia failed in making any individual final. No Romanian gymnast has made any individual event finals but Larisa Iordache. Elisabeth Black of Canada qualified to balance beam final in 5th place and all around final in 14th place. US Madison Kocian came in 17th place in the all around qualification results but won’t compete due to two per country rule. Giulia Steingruber qualified in 8th place to vault final and in 18th place to all around final. Anna Pavlova of Azerbaijan won’t compete any further in the competition. She fell on vault and had a low score on floor exercise. Indian Dipa Karmakar who successfully landed her Produnova at Commonwealth Games, came in 10th position on vault hence she won’t be in final. Japan’s Asuka Teramoto made the beam final by placing 8th. Team final will be on Wednesday, all around final on Friday and event finals on Saturday and Sunday.